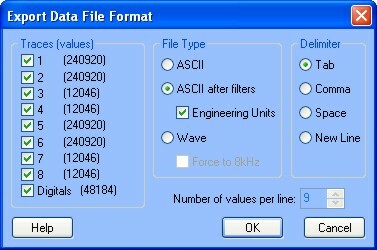 The New Derived Windows which users will find helpful when analyzing data acquired from more than one unit. New features include data which can be cut from one or more traces allowing for data to be overlaid from different times within the same trace or different traces. You will be able to overlay Power Spectra from different times within the same trace or different traces, and up to 4 trace/trace (XY) graphs can be overlaid. New Snap To Max/Min option added to quickly mark the highest or lowest part of a trace. Export any number of traces in a recording using more than one unit. New Power Spectrum Option added to in-context menu; this allows a Power Spectrum to be displayed for any marked time. Multiple workspaces may be saved. In addition, when the application is closed, the current complete workspace is automatically saved in a file called "Workspace when last closed". The workspace with the associated data files may be saved as a ZIP file which can be extracted using many third party applications. This facilitates electronic mailing of the data analysis results. The Expanded Results Table may be copied to the clipboard and pasted into other applications, such as MS Excel, for further analysis and printing of results. Open an unlimited number of data files with the option to track the time axis across all files allowing display and analysis for a large number of channels. 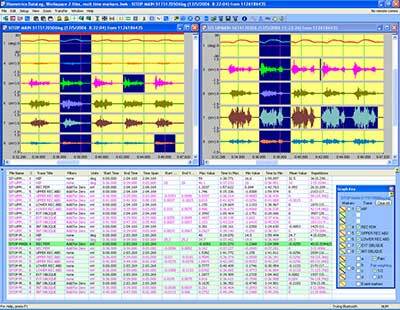 Waveform display in multiple windows and formats with full zoom, scroll, and area marking facilities, option to split, tile and cascade windows. 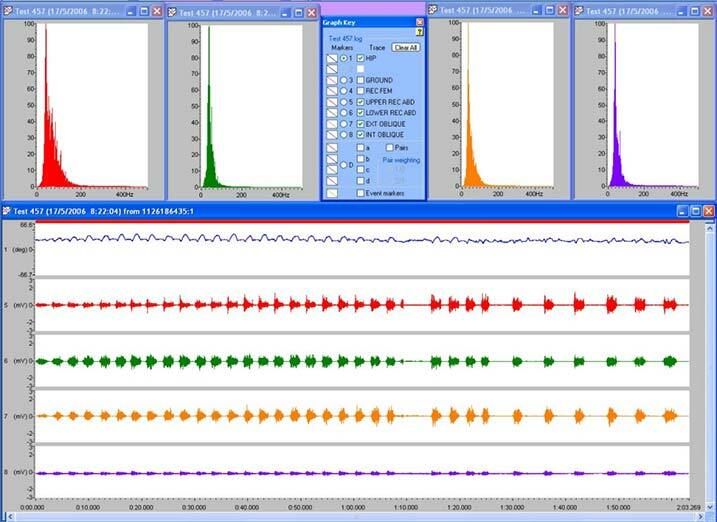 Waveforms within the same window may be viewed overlaid or as separate traces. Easily toggle between the two views with a simple keystroke. Engineering units with custom scaling ability on all traces independently. Ability to set an unlimited number of vertical cursors (time markers) to a single trace, all traces in a window, and across multiple windows giving total flexibility. All values are shown simultaneously in the expanded results table. All vertical cursors may be altered via expanded results table by typing in time values to 0.001S giving maximum control. All horizontal cursors may be altered via expanded results table by typing in Y value to 0.01 giving maximum control. Comprehensive Help menu that may be used as a tutorial for both the hardware and software operations. As soon as a file is opened it is displayed as a raw EMG file and may then be subject to any or all of the features listed above. The data may be left as a whole or truncated into smaller files of specific data for further analysis. Of course not only EMG data may be displayed at any one time. The Y axis may be labelled with any units governed by what sensors where connected at the time of recording, e.g. Kg or lbs for force or degrees for limb movement. These units are then saved with the file and automatically compute every time the file is reopened. The digital inputs are displayed on a separate graph to the analog inputs. Using this facility during gait analysis, toe and heel contact and off may be obtained using the contact switch assembly type no. FS4. The Display to the left shows a Workspace containing unfiltered EMG data (abdominal muscles) with Goniometer data (hip flexion/extension) and EMG Power Spectrum.